It’s all good, unless you get stung! This post is quite short, as I am getting it up in a hurry for my followers. Today I am focused on the mysterious Treble Media Days. What I have noticed in the past 48 hours, is that some traders are potentially swapping their portfolio, week in week out. There’s nothing bad about this, it’s a little like ‘Fantasy Football’, however, it can be very risky. Of which I explain below. Traders are addicted to profit, which is not a bad thing. A lot of money comes in the form of dividends, mostly Performance Buzz, as there are 4 Ways to win. So, when the Performance Buzz is non existent, traders are treated to TREBLE MEDIA DIVIDENDS. This causes lots of traders to ‘chase the dividends’, essentially removing their whole portfolio of players which could win Performance Buzz, replacing these with players who could win Media Buzz. Unfortunately, there are very few players who have a great chance of earning PB & MB, Neymar, Harry Kane, Messi, Ronaldo (the elite players). So, for any non elite performance buzz player, you may have experienced a drop in your portfolio. This is the perfect example of a Portfolio switch. Not all traders are patient, they want to win buzz daily. Chasing Media dividends can be a very risky strategy. The dividend cut-off is 14:00PM, which means traders have plenty of time to see who has scored points early-on, enabling them to Trade and potentially win dividends if the player holds his spot. This example is Luke Shaw. Early this morning he had already scored around 460 points, which is quite a lot for Pre-11AM news. If this was to continue, surely he would win Media Buzz for the day. This is also what the Dividend hunting traders thought, so they decided to put some money into Luke. I will describe below the Risks. 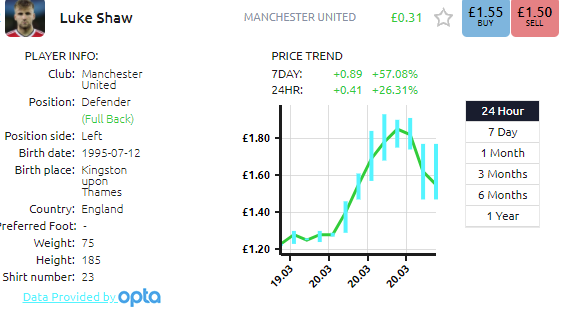 Luke Shaw started the day at £1.23 per future. He Peaked at £1.93, just before the 2pm dividend deadline. Mo Salah and Neymar have since shot up the rankings. Salah leads Shaw by 90 points, Neymar trails Shaw by 230 points. Since the rise of Mo Salah to #1, Luke Shaw has dropped from £1.93 to £1.47. This is a £0.46 Loss for anyone who got in near the top. If you owned him this morning at £1.23, you aren’t in a bad position as you’re £0.23 in profit per share, with the potential dividends. Since taking first place in Media Rankings, Salah has risen around £0.17. This could be money moving from Shaw/Salah. The risky thing about trading in this way, is that the crashes can be devastating. If you get on near the top end of the price, you may be in for a shock once the dividends have been paid out, as this is when some traders decide to cash out and jump onto the next media prospect. This one is tough to conclude, although I don’t operate in this way, I can see why traders would. If you can get in at the low end of a players price, earn a media dividend and then sell for break-even, or even a small profit then it definitely sounds lucrative. I prefer, and recommend to hold a balanced portfolio. There’s no need to rush in selling your performance buzz players, just for one week of POTENTIAL Media Buzz dividends. BUT, you can see why a trader would. The prospect of £0.08 x 7, £0.05 x 7 & £0.02 x7 is very lucrative. Just remember to always take into consideration the 2% Commission and spreads. Purchasing 100 Mo Salah would cost £814. If you insta-sell him you will get £790. You would hope to be winning quite a few media buzzes to be coping with a £39.80 loss, and this is if he doesn’t drip post-payout. Football Index Sign Up Bonus – Get £500!